Apple’s lead in the tablet market took its first serious dent in Q3, according to estimates from analyst IDC, based on tablet shipments (rather than sales). Apple’s dominant share of the market shrunk in the third quarter of this year, dropping from 59.7 percent in the year ago period (and 65.5 percent in the second quarter of this year) to 50.4 percent in Q3 this year, while Samsung and Amazon both grew their share: Samsung took close to a fifth (18.4 percent) of the market in Q3, up from 6.5 percent in the year ago period, while Amazon grew from nothing last year to almost a tenth (9 percent) in Q3, following the launch of its original 7-inch Kindle Fire and 7-inch and 8.9-inch Kindle Fire HD tablets. Samsung’s growth was fuelled by its Galaxy Tab and Note 10.1. tablets. 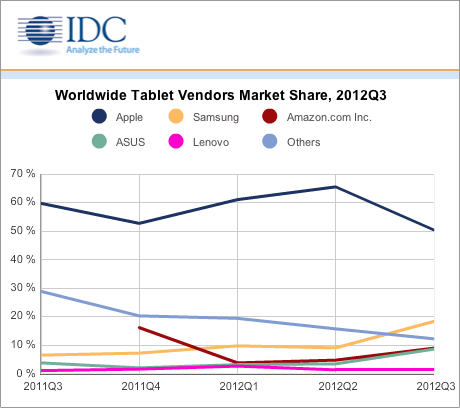 The company shipped 5.1 million tablets worldwide in 3Q12, up 115 percent from 2Q12 — an increase of 325 percent from 3Q11, when it shipped 1.2 million tablets, noted IDC. IDC also calculates that Asus — which makes Google’s Nexus 7 tablet , and recently reported a monthly sales rate for the Google-branded slate of close to one million— also grew its share over the period, rising from 3.8 percent a year ago to 8.6 percent in Q3 this year. The analyst expects Apple’s performance to improve in Q4 — although it notes that the iPad mini’s relatively high price-tag still leaves room for Android OEMs to grow their share further. “Now that the new mini, and a fourth-generation full-sized iPad, are both shipping we expect Apple to have a very good quarter. However, we believe the mini’s relatively high $329 starting price leaves plenty of room for Android vendors to build upon the success they achieved in the third quarter,” added Mainelli.